Columbia Property Trust, Inc. (NYSE: CXP) announced today that it has completed the sale of One and Three Glenlake Parkway, a fully-leased, 711,000-square-foot office campus located in Atlanta’s Central Perimeter submarket, for $227.5 million. 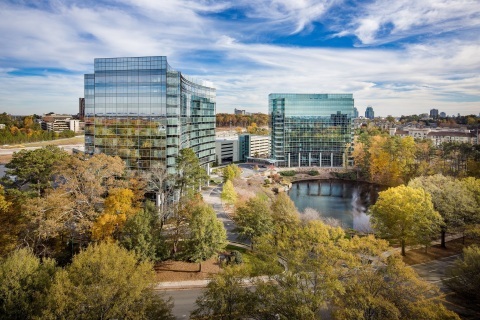 Columbia Property Trust has sold One and Three Glenlake, a 711,000-square-foot office campus in Atlanta, for $227.5 million. Photo credit: APG Photography. Columbia completed a significant repositioning of the campus in advance of the sale, to position it as best-in-class for Atlanta’s Central Perimeter submarket. These efforts helped to drive 460,000 square feet of leasing at the property since early 2017, replacing the original anchor tenant with no downtime and returning the full property to 100 percent leased. Columbia acquired One and Three Glenlake in 2003 and 2008, respectively. Columbia Property Trust (NYSE: CXP) creates value through owning, operating and developing Class-A office buildings in high-barrier U.S. office markets, primarily New York, San Francisco, and Washington D.C. Columbia is deeply experienced in transactions, asset management and repositioning, leasing, and property management. It employs these competencies to grow value across its high-quality, well-leased portfolio of 18 properties that contain over eight million rentable square feet, as well as one property under development. Columbia has investment-grade ratings from both Moody’s and Standard & Poor’s. For more information, please visit www.columbia.reit. Certain statements contained in this press release other than historical facts may be considered forward-looking statements within the meaning of Section 27A of the Securities Act of 1933 and Section 21E of the Securities Exchange Act of 1934. We intend for all such forward-looking statements to be covered by the applicable safe harbor provisions for forward-looking statements contained in those acts. Such statements include, in particular, statements about potential transactions and investments, and are subject to certain risks and uncertainties, including known and unknown risks, which could cause actual results to differ materially from those projected or anticipated. Therefore, such statements are not intended to be a guarantee of our performance in future periods. Such forward-looking statements can generally be identified by our use of forward-looking terminology such as "may," "will," "expect," "intend," "anticipate," "estimate," "believe," "continue," or other similar words. Readers are cautioned not to place undue reliance on these forward-looking statements, which speak only as of the date of this press release. We make no representations or warranties (express or implied) about the accuracy of any such forward-looking statements contained in this press release, and we do not intend to publicly update or revise any forward-looking statements, whether as a result of new information, future events, or otherwise. Any such forward-looking statements are based on a number of assumptions involving judgments with respect to, among other things, future economic, competitive, and market conditions, all of which are difficult or impossible to predict accurately. To the extent that our assumptions differ from actual conditions, our ability to accurately anticipate results expressed in such forward-looking statements, including our ability to generate positive cash flow from operations, make distributions to stockholders, and maintain the value of our real estate properties, may be significantly hindered. See Item 1A in the Company's most recently filed Annual Report on Form 10-K for the year ended December 31, 2018, for a discussion of some of the risks and uncertainties that could cause actual results to differ materially from those presented in our forward-looking statements. The risk factors described in our Annual Report are not the only ones we face, but do represent those risks and uncertainties that we believe are material to us. Additional risks and uncertainties not currently known to us or that we currently deem immaterial may also harm our business.